Everyone knows I love politics, but few know that Lyndon Baines Johnson was my favorite president. I admire his deal-making skills, and his ability to subordinate his own personal agenda for the big picture or the greater good. Though he was a total redneck, he ended up contributing greatly to the development of better rights for less privileged members of our society. He also had a wild and crazy wife named Lady Bird. Homegirl was a great cook, and I’m stealing her recipe for Pickled Okra for my website. The okra at Larry’s Produce has been off the chain lately, so I have been making as many okra dishes as possible. Figured pickled would make sense, so we could enjoy them later in the year. I’m an OK pickler. Not a great pickler, but an OK pickler. 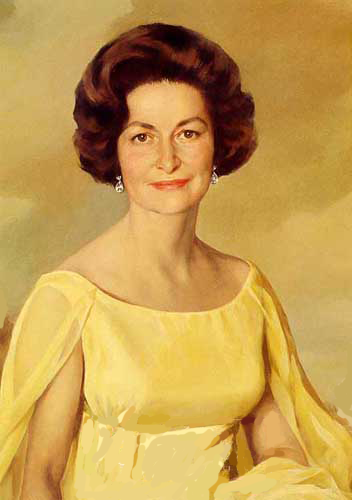 Lady Bird Johnson must have been a great pickler, since her husband was President of the United States. Anyway, I pretty much followed the first lady’s recipe to a “T”. This entry was posted in Food, Politics by Brett. Bookmark the permalink.